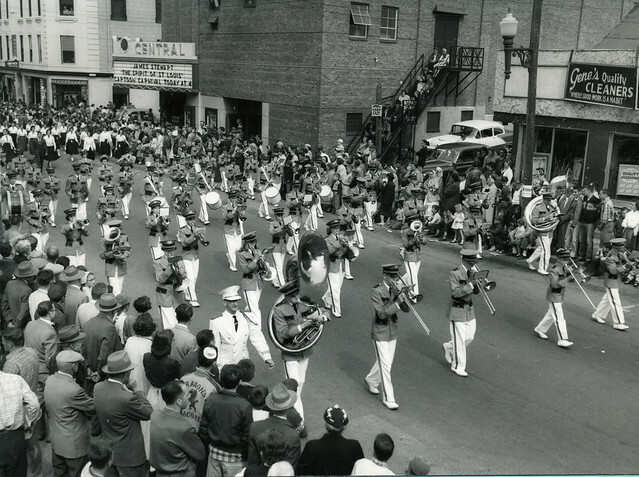 Top image: from the McArthur Library collection, captures both a parade in Biddeford and the Central Theater beyond it. This building is now used for the Biddeford Police Department, and is a real beauty and landmark in Downtown. Bottom image: the LaKermesse Festival parade, June 2009. 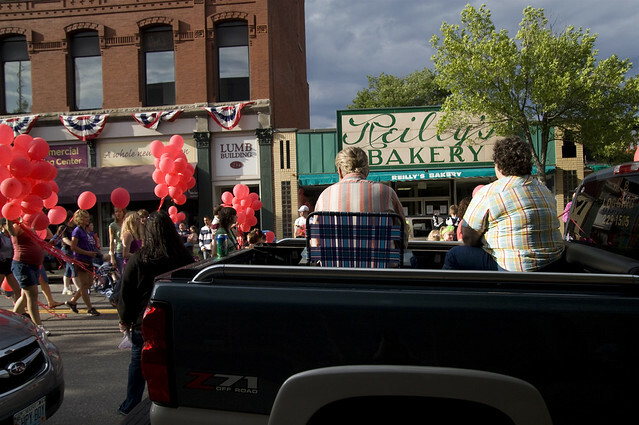 Reilly’s Bakery, just beyond, celebrated its 100th anniversary this last summer. Photos are courtesy of the 2009 Heartworks Collection by Claire Houston and Anna Schechter, Salt Institute for Documentary Studies Fellows sponsored by the Heart of Biddeford. Biddeford, Maine is a city filled with roots and routes: stories and traditions built into the streetscape allow us to feel rooted in a place we can call home. At the same time these spaces and places, whether vacant, inhabited, or under restoration, present us with many paths into the future. With this blog series, we want to present some snapshots of Biddeford’s historic roots as they appear today in people, places, and the stories that connect them. In the process, we also want to explore where the city might be headed. Biddeford planners, community members, and local youth are working together to plot a route to the future for the place they call home. Biddeford is located in Southern Maine on the I-95 corridor, two exits south of Portland and less than a two-hour drive from Boston. The Amtrak Downeaster rail line also makes a stop in the downtown area on its regular trips between Boston and Portland. 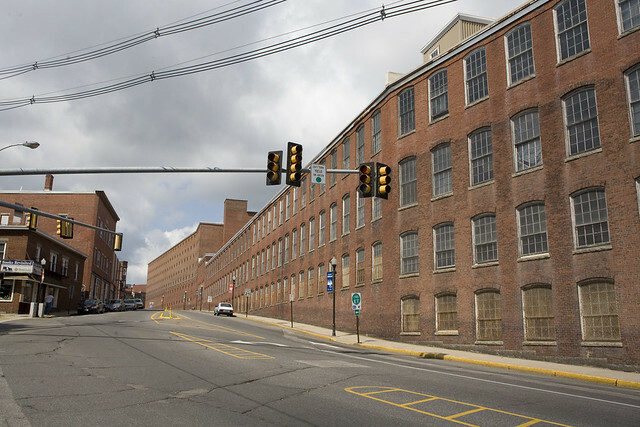 Main Street runs alongside a hulking, multi-million square foot mill complex – a reminder of Biddeford’s roots as a global hub of the textile industry. In the 1830s and 40s, Samuel Batchelder, the man behind the Hamilton Mills in Lowell, Massachusetts, harnessed the power of the Saco River to develop Biddeford’s Pepperell and Laconia mills. Much of the labor required to build and run the mills came from immigrants. Israel Shevenell, who arrived on foot in 1845, was the first of many newcomers to make the trek from French Canada. Although the industry that once anchored the downtown is gone, Biddeford is still known for its strong Franco-American heritage. Today local developers, small business owners, and groups like the Heart of Biddeford are working to reinvigorate the downtown area. New developments in the mills are gradually creating a mixed-use district with restaurants, residential apartments, artist studios, and commercial offices. Since 2008, the Heart of Biddeford has been working with support from the Orton Family Foundation to create the Heartworks Downtown Master Plan, a vision for the downtown based on input from a cross-section of the community. Two years ago, under the leadership of Holli Andrews & Carolyn Gosselin, the senior class of Biddeford High School organized their voice for change in Downtown Biddeford. In Partnership with the Heart of Biddeford, City of Biddeford, and the Orton Family Foundation, BHS students used digital media to craft stories that reveal the heart & soul of downtown Biddeford. Students from the class of 2009 produced digital stories by turning the camera on their elders, families, and friends. The stories they gathered illuminated a time from the past when the downtown was a bustling, vibrant place where people went to do business, go shopping, go to work, socialize and recreate. Today, the buildings that stand are vestiges of the past; many storefronts sit empty and the small businesses that remain downtown are faced with the the challenge of attracting enough business to sustain themselves year to year. Above, young people with great ideas to revitalize their downtown in Biddeford, Maine. The students who participated in this project were deeply interested in the future of their hometown. Because they represent a broad cross section of the community, their contribution has proven invaluable to the downtown master planning process. This year, making use of their digital storytelling skills and the historical material they have already uncovered, the students will be given a chance to imagine Biddeford’s route into the 21st century. Stay tuned for more of their portraits of Biddeford’s Roots and Routes. Post by Nick Kaufmann and Holli Andrews. Photo source: Butler, Charles L. Jr. “Images of America: Biddeford”. Arcadia Publishing ©2003. This post is the first in a series called Biddeford, Maine: Roots and Routes. This series is part of the Portraits of Place project.